Can the age you got your first period increase your chances of developing fibroids? Fibroids are non-cancerous growths within the muscle wall of your uterus and are most common in women during their reproductive years. 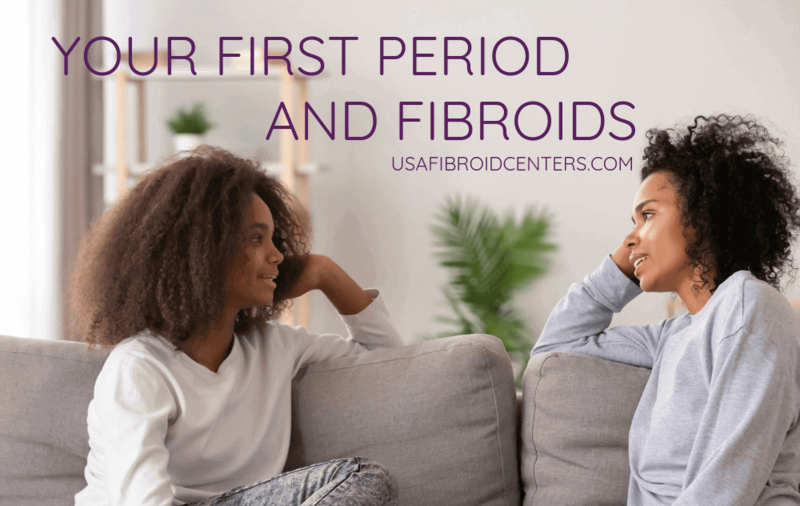 For some women, uterine fibroids may not causes any symptoms, however for others they can cause heavy bleeding during and in between their periods, severe cramps, frequent urination, fatigue from anemia, and reproduction complications. The National Institute of Health (NIH) estimates that up to 80 percent of women develop fibroids by the age of 50. Subserosal: When the fibroid grows outside of the uterus, they are termed as subserosal fibroids. They are named this because they tend to grow within the outer layer lining of the uterus called the serosa. Submucosal: This occurs when the benign tumor bulges into the uterine cavity. Submucosal fibroids are most often associated with abnormal vaginal bleeding causing anemia. Pedunculated: These fibroids are a specific classification of either subserosal or submucosal fibroids. These may attach to the uterus with a stalk. Pedunculated fibroids can also cause unexpected, sharp pelvic pain. This may happen when the fibroid rotates on its stem and the movement interferes with blood flow to the fibroid. Fibroids are more common in women who begin to menstruate at an early age. In a recent study, early age of first period (menarche) was found that women who began menstruating early, had a greater risk of developing fibroids. The association of early menarche was strongly related with the development of multiple fibroids. In the same study, early age of menarche was found to be more common in African American women. There is another study indicating that the women menstruating before 12 years of age had higher chances of cardiovascular disease (CVD) compared to those whose periods started later. The study also revealed that those who had a hysterectomy were more prone to CVD and heart disease risks. And if the surgeon also removed the ovaries during the hysterectomy surgery, the woman’s chances of getting CVD were doubled compared to women whose ovaries were not removed during the hysterectomy. Other factors contributing to the development of fibroids include deficiency of vitamin D, a diet high in red meat, and obesity. For many women, uterine fibroids do not cause any painful or disruptive symptoms. However, in women where they grow bigger or there are multiple fibroids, these symptoms can interfere with their fertility and chances of becoming pregnant. Women who suffer from symptomatic fibroids can experience difficulty becoming pregnant or carrying the pregnancy to term. Though surgical options like hysterectomy and myomectomy are available for the treatment of fibroids in uterus, many women in their childbearing years do not want to have a procedure done where their uterus is removed. This causes many women with uterine fibroids to suffer through their painful symptoms so they can retain the possibility of becoming pregnant. Even for women who are not concerned about retaining their fertility, hysterectomy has a high price to pay when it comes to negatively interfering with your body’s natural hormones. Deciding between surgery to remove the uterus and living with pain is not the only option for women with symptomatic uterine fibroids. If you’re a mother or guardian, it’s important to talk about period abnormalities at an early age. Opening up the dialogue about what’s “normal” to expect, and what’s “not normal” to expect during menstruation helps bring awareness that intense cramping or heavy, lengthy periods may be caused by something else. Suggest that they track their period, so they are able to notice changes in their menstrual cycle. Knowing that you, or someone you love, is at an increased risk for developing fibroids can help you prepare if you need to seek treatment. Many of our patients have said that they didn’t know something was wrong because they thought having heavy periods that lasted over 10 days was just normal for their cycle. Living with debilitating symptoms can become a daily struggle that no woman should be forced to “just deal with”. Non-surgical procedures are available at USA Fibroid Centers for the treatment of fibroids in uterus. The procedure is known as Uterine Fibroid Embolization (UFE) and is administered by our interventional radiologists. During the procedure, your doctor will administer a light sedative and then use an advanced ultrasound to locate your fibroids. Next a small incision will be made on your upper thigh so a catheter can be inserted and directed to the uterine artery that supplies blood to the fibroid. Then, small particles will be injected into the artery to block the blood flow from the fibroid. This will cause the fibroid to shrink and eventually die. Once this is completed, the catheter will be removed and a small bandage will be placed over the incision. The entire procedure takes approximately 30 to 45 minutes and then you will be able to finish your recovery at home. This outpatient procedure for fibroids pain treatment is completed in our outpatient clinics so you avoid a hospital stay. In addition, since UFE is a minimally invasive procedure, there is a reduced risk for infection or other complications that are often associated with surgery. UFE does not interfere with hormones and preserves your uterus and all its functions. If you are looking for uterine fibroid treatment, give us a call 855.615.2555 or visit our website www.usafibroidcenters.com and our representatives will arrange your consultation with a uterine fibroid specialist where you can receive a formal diagnosis and customized treatment plan. UFE is chosen by a large number of women because it effectively eliminates fibroid symptoms with minimum discomfort. UFE is the preferred choice for treating large fibroids, because it gives women the freedom to choose a treatment that avoids major surgery. Our treatments are covered by Medicare, most major insurance plans, and some Medicaid plans.